After pushing the Nike Air Max 98 in a big way for its 20th anniversary last year, the model has been standing out within the retro footwear repertoire with its multi-textural designs and throwback stylings. Following the “Wild West” pack and the Charlotte Hornets-inspired silhouette, the Swoosh now gives the pair a polychromatic snakeskin treatment. The latest iteration boasts a futuristic look with its lab-white base color and the translucent Air unit. Abstract-shaped python skin overlays in Warhol-inspired green, red, yellow and pink are scattered across the uppers, while hits of black on the heel strap and the laces, and a green-outlined Swoosh finalize the design. 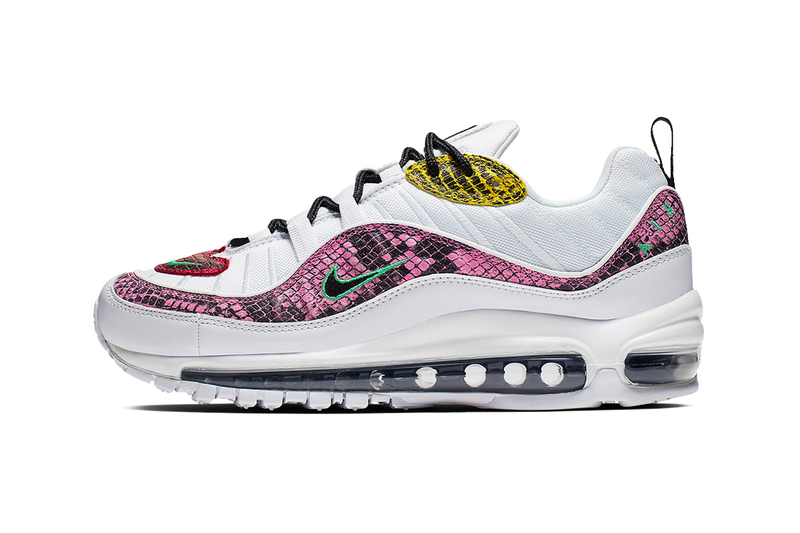 The multi-colored snakeskin Air Max 98 is currently only available in women’s sizing. These highly-anticipated sneakers can be purchased in the coming weeks on Nike.com and at select retailers. Stay tuned for more details on the official drop date. In more sneaker news, check out Nike’s Latest Air Max Plus Premium. Baba Yaga doesn’t do Yon-Rogg.